In loving memory of Fr. Albert Meersschaert, CICM: seasoned liturgist, wise confessor, holy priest of God who dies on August 12, 2010 at the blessed age of 95. 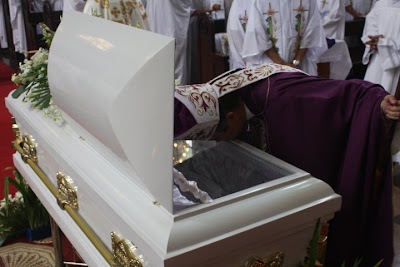 Homily delivered by Archbishop Socrates Villegas, Archbishop of Lingayen-Dagupan during the Funeral Mass for Father Albert Meersschaert, CICM, priest, held last August 16, 2010 at the San Carlos Seminary Chapel at 9:00 am. Father Albert, how can we ever thank you? You were our teacher. Your booming voice, that filled not only the classrooms but the corridors as well, was nothing compared to the ringing voice of your witnessing to priestly fidelity, simplicity and discipline. You were our gentle confessor and spiritual guide. Our sins as seminarians and priests were repetitious and so were your advice and questions in the confessional. And yet even if we knew that the confessor’s advice and poking questions would be the same, we still went to you with trust and confidence because we were so sure we would meet God each time we met you. You were our faithful cheerleader in our little priestly triumphs. You attended our ordinations and kept track of our changes in assignments. You were our conscience. You were our walking liturgical rubrics. You were our idol. You taught us how to pray. You taught us how to sing the Mass. You taught us how to swing the censer. You taught us to genuflect and kneel and stand and bow and prostrate. You taught us how to hold the chalice and host. You were all these and more. And now, you have returned to the house of the Father. Now that you cannot be any of these anymore, Father Albert, you are now our Karlista patron saint in heaven. Father Albert, how can we ever thank you? You loved San Carlos Seminary with so much passion, with so much vigor, with so much heart. I don’t think anyone has ever loved San Carlos Seminary in Guadalupe more than you. No other priest has stayed on at San Carlos Seminary as rector and professor and formator and confessor more than you. No other priest formator has given the Church such number of alumni archbishops, bishops and a Cardinal more than you. No other professor of San Carlos Seminary Guadalupe has lived to reach ninety five years old and seventy one years as a priest more than you. No other professor has prayed and sacrificed so much for the Karlista priests more than you. 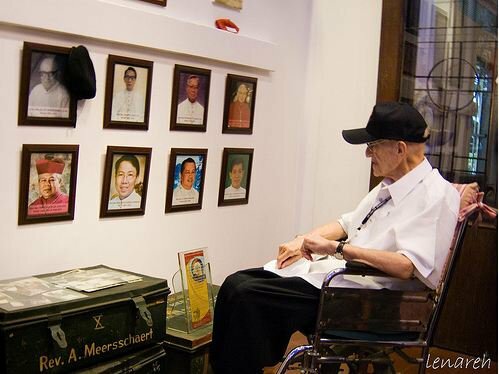 In your retirement at the CICM House, every visit to you meant reminiscing the old days of San Carlos Seminary. How you offered the loneliness of your retirement and the discomfort of your sickness and old age for the sanctification of your priest sons! Father Albert, you are our champion. You are our record breaker. You are the pride and honor of San Carlos Seminary! Father Albert, how can we ever thank you? You taught us how to treasure good liturgy. You taught us that good liturgy can make us holy. You taught us that good liturgy must be well prepared. You taught us that good liturgy must be clean and orderly. You were the altar server of Popes and Cardinals. You were the altar server of archbishops and bishops. You allowed yourself to become the altar server of your former students. Your humility is awesome. Your humility is the mirror of the humilitas that dear San Carlos Borromeo followed as his life motto. But underneath that finesse for liturgy, there was the Father Albert whose heart was always ready for the call of the Lord. In the twilight years of your life, you taught us that good liturgy does not begin and end at the altar. The favorite altar of God is the human soul and the highest act of liturgy is the self sacrifice of a loving and pure heart. And you are that Father Albert—you were our liturgist at the altar and you made your heart that altar. In your final years with us, you made your frail and sickly body the altar of the sacrifice of Jesus. You allowed your voice to be His voice. In your body, you continued the self oblation of Jesus for the salvation of the world. Thank you, Father Albert, for teaching us how to make our liturgy truly pleasing to the Lord! But I know Father Albert that if I would ask you “How can I ever thank you?” you would brush me aside with your hand, move your face close to my face until I could smell the odor of cigar and coffee and everything else that you have drank and eaten, and say to me “Oremus pro invicem” with a smile of a pious wise man. Father Albert: Oremus pro invicem. We will pray for you. We will beg God to look kindly on you, give you His peace and include you among the saints in heaven. Does not the Liturgy of the Hours say: “Those who are learned will be as radiant as the sky in all its beauty; those who instruct the people in goodness will shine like the stars for all eternity”. In the eternal liturgy of heaven that you now enjoy, may those words be said of you and may the God of Wisdom welcome you to paradise. At ninety five, it must have been hard to see confreres leave for heaven and leave you on earth. It must have caused you secret tears to attend the funerals of your own students, priests much younger than you. Now, you will not see any more deaths and funerals. The victory is won! Father Albert, oremus pro invicem. We will thank you endlessly by praying for you ceaselessly. Father Albert, pray for us. We need your prayers even more now. You know our struggles and temptations. You know the trials we are subjected to. You know us well enough. Pray for us as you have prayed for us through your seven decades as a faithful priest of God. We saw your secret hurt when you heard your students falling out of the path and treading a different route. Pray for us that we may be faithful like you; faithful to the Father like Jesus. Pray for us to be humble and pure like you. Pray for us to be obedient and loyal like you. Oremus pro invicem Father Albert. Father Albert, we promise you: We whose lives you have touched, we whose vocation you have nurtured, we who want to follow the Lord—we will help one another by praying for one another. We will stop gossiping about one another. We will believe again in the power and beauty of priestly brotherly prayers. And we promise that when we say Oremus pro invicem, we will really pray for one another. In your life, we have seen that prayer indeed works. We will continue the chain of intercessions among us. We promise you Father Albert! In heaven I know you will be reunited with dear Father Leo and my beloved Cardinal Sin. Please bring them our love. Please bring them our loving request—oremus pro invicem. Pray for San Carlos Seminary. Pray for us. Father Albert: Tibi gratias, oremus pro invicem! Requiescat in pace. Amen. Alleluia! can move ahead and make money. It also happens sometimes that your character will say something silly.